Big, white, cuddly Bear tries to have quiet time alone. Large white lettering over a deep blue background presents the sparse text, perfectly worded for a beginning reader to figure out or for a preschooler to memorize. Seated on the soft white ground of the verso, which might or might not be snow, Fox asks Goose, “Where’s Bear?” and Goose, pointing to the recto with a feathery thumb, replies, “Over there.” Just on the other side of the gutter, Bear sits holding something, a dreamy look on the fuzzy countenance. As the page turns, the two smaller animals continue to stare toward Bear, and Goose explains Bear’s occasional wish for solitude. When Fox decides to “be alone with Bear,” who is by this time staring at a small spinning top, the humor escalates. Bear succinctly replies to Fox’s chattering queries: “Occasionally, I like some quiet time.” As Fox tries to join Bear’s quiet time, the small red critter’s idiosyncratic interpretation of “quiet” leads to paws on the head, rolled eyes and other hints of ursine distress. Eventually, Bear is moved to firmer, although never intimidating tactics. 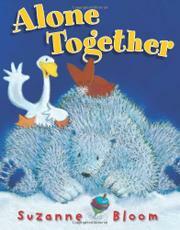 By the time Goose rejoins the trio, Bear and Fox have attained agreement…or have they?